Mariko begins College next month so it is time for her to get situated in her dorm. She will be attending College near Fuchu and word is out that she will also attending with Royalty. Someone from the Royal Family of Japan will also be attending her first year at this prestigious College. God bless you Mariko, be a witness for Jesus Christ, we are going to totally miss you. Keep in touch through e3missions, we love you! Amanda becomes the official number of the most blogs written ever on e3missions. And we celebrate it by announcing that she now has her Alien Registration Card (Gaijin Card) she officially is an Alien resident of Japan. Praise the Lord Amanda, God is so good! It is absolutely delicious! Made from our own special stock! The secret of the Hawaiian Shoyu Ramen is under wraps, only a few people have been privileged enough to know the recipe. But let me fill you in on a little secret……shuuuuuu…… the original stock goes way back to Summer 2009. Stephen arrived safely from Central California last night. He came in kind of late, 10:30pm. Zach and Rob picked him up right on time at the airport. Brother Stephen will be sharing leading in worship and doing some outreach concerts for the Glory of the Lord. Please pray for a fruitful Easter season this year. That says it all, Yoshua and Emi did an excellent job! Thank you, both of you for sharing your gifts with us. Yoshua blessed us with a good testimony and shared in the Word. God is doing a great work in Yoshua’s life, thank you bro. Here we are caught in the act. The funny thing is not so much how big our “to go” ice creams are, but check out Justin’s, those are some tiny scoops bro. Jillian cannot get away from it, we know she likes ice cream now. The last time she said the ice cream machine got stuck at the Yakiniku restaurant. But there are no excuses here girl, that is a big scoop there. We were all rockin it (except for Justin). Hold on, before you get too excited we split this between 4 people, Asa, Tom Cotton, Zach and Pastor Tom. We ordered the “ondish burger” but they ran out of the homemade buns. So they asked if we wanted the big burger that feeds four, so we said “Go for it”. The big burger and 4 orders of fries, plus the ice cream. We were a group of happy dudes! Did I mention it came with 4 eggs inside? We took over the whole back room! We had reservations for 5:30pm and you know we are not going to be late. Everyone was so blessed to be there for this surprise dinner. We were a bunch of happy campers, can you see the joy in Toki’s face? We went to Ondish for dinner on Monday night. Someone blessed all the Bible College Students with a night out. So we had our fill of food and “all you can eat” ice cream! It was awesome! As we were ordering someone pointed out “Hey, that kid on the menu looks like Masaki” we checked it out and what do you know it does look like him. Masaki, you are famous! On the cover of Ondish, what an honor. The Newell’s are going to have another baby! Masaki is going to have a brother or sister. We are excited for Tim and Ayu, the Lord blessed them again! 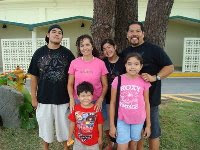 The church in Nago is beginning to grow, one member at a time. Hummm, I wonder what the baby will be, boy or girl? Give us some insight folks, what do you think Ayu is going to have? Give us some comments below and tell us what you think. Congratulation Newell Family, we are so blessed for you all! Hannah made a delicious huge two flavor cake in honor of Justin and the “goodbye crew”. The cake was chocolate on one side and white on the opposite. It was delicious! God bless you all, and Happy Birthday Justin. It is very interesting; Commodore Perry once said “Okinawa will be the gateway to the Orient”. Also there have been numerous prophecies that God was going to use Okinawa to reach all of Mainland Japan. This is not the beginning, but God is sending 4 more soldiers into His work on the Mainland. At the end of w2 we had a good time of just seeking the Lord. When the after glow was done, some people spent some extended time in prayer. It was a blessing! God spoke to all of our hearts as we spent time with Him. The key came from Andrew’s message; “repentance in our hearts”. For those of us who were there, God spoke in a powerful way. If you were there, maybe you can write a comment without publishing your name of what the Lord spoke specifically to your heart, and encourage to the readers. She conveniently reminded me that I did not put up her Birthday picture because we were stuck on Tonaki Island, and also she was upstairs when we took the “March Birthday Blog” (scroll down to see). But seriously, Happy Birthday Hannah, thank you for all you do behind the scenes. If it was not for you in the beginning especially, there would be no Birthday cakes (you are an excellent baker). Happy Birthday Hannah! Ome City Girl, that is what we call her. It is time for Erin to head back to Mainland Japan. School starts Monday morning and she needs to be ready. Thank you Erin for being with us this week, we love you very much and we are going to miss you girl. May the Lord continue to bless all your work that you do for Him. A group picture, they are the best! Here are most of the Bible College Students from Ginowan. Everyone had a great time at the Smith’s wedding. All dressed up and somewhere to go! Back to Ginowan, back to Studying the Word, oh yeah, every day in the Word! Well, we finally hit it. 100 blogs this month and counting. There were a lot of things to report about. The most recent Natsuki’ wedding, Men’s retreat, Tonaki trip, the visit of Tom Hallman, a ton of birthday’s, Apologetics Conference, Hina Matsuri, White Day, you name it. It was a real blessed month. And the best about it, it still is not finished. This is a beautiful picture of some of the gals of Ginowan. They were dressed so beautiful for the wedding. When we left the wedding Paul and Natsuki had gifts for all of those who attended. They also gave some of the gals the flowers from the tables. Thank you Smith’s for such a wonderful time, we were all blessed! It was a beautiful wedding followed by a beautiful reception. The Smith’s, can you believe it! We are all so blessed for you. This is just the beginning of a beautiful life together. Please leave Natsuki and Paul a wedding greeting below. Paul and Natsuki are Married! Today we celebrated a beautiful day, the day that Natsuki got married. They were married on Camp Kinser and had their reception at the Kinser Surfside. We were so blessed for this couple. We love them both so much. God Bless you Smith’s, may the Lord bless your new life together. My relationship with the Diaz’ goes way back to 2004 when I took my third trip to Israel. The Diaz family come from Napa Valley in Central California. It is a blessing to have them with us this week. They will be traveling the island seeing all the sights. May the Lord bless Tony and Melinda and may they have a blessed time on Island. Today, Saturday the 27th, Justin Diaz turned 19 years old. He had a blessed day. His parents are here from California visiting for one week. They went up North today and visited the World Famous Nago Pineapple Park as well as chilled out on some secluded beaches. God bless you Justin and Happy BIrthday bro! Roy Toma was our guest at the Bible College this Friday morning. It is always a blessing to have Roy with us. He has been on island for a little over 6 years now and continues to serve the Lord full time at Campus Crusade for Christ. He also serves at CCOkinawa. Thank you Roy for always blessing the students. It was a blessing hearing the testimony that Taliya gave us during morning devotions at the Bible College. We are so blessed to have all the students here this semester. Thank you God for all that you are doing in our lives. Four Pastors with their history stating back to California to the early 90’s. We are here in Okinawa together for a short time. Pastor Tom Hallman is safely back in Virginia with a little jet lag but doing good. Thank you Tom and Brian for taking the time to come out and bless us all, Praise the Lord! Wednesday night March 2006 was the first service at the Koinonia Cafe then located in Ganeko, Ginowan City. The first service started out with twelve disciples (well 11 1/2 Emi is so young). I was in Israel at the time, but it did not stop the group from meeting. Wow! That was a long time ago, time sure flies when you are having fun in Jesus! We celebrate 4 years today. This is an old video of what the Sanctuary used to look like before we completed all the work. It is amazing to see the work completed that the Lord began. It is just like our life. We were all messed up, and then the Lord made us new. The best thing is that He is not done with us yet, He is still doing the work. Please click on the video above. These are some of the videos that we have of the early Koinonia Cafe. Today we are celebrating its 4th Anniversary. God has brought us so far in the last 4 years. We look forward to what He has in store next. For those of you who do not know Erin Shaver, she is a wonderful gal and also a Karate Instructor in Ome City. At Grace Church in Ome Erin teaches Karate to a group of students. The Lord continues to use her gifting for His Glory. It is a blessing having our sister with us for this week. It is going to be a bummer to see her go. Today we celebrate 24 years of marriage. Where did the time go? It really has flown by. I thank the Lord for blessing me with such a wonderful wife. I thank that Lord for the wonderful parents that Joanna has. Mr Sandoval was such a loving father who really taught Joanna how to love and care. Mrs. Sandoval is still a great mother in law who continues to pray for all of her children, grandchildren and great grandchildren. But really most of all I thank the Lord Jesus Christ for bringing to me such a special woman. It brings great peace to know that you have married the right gal. The gal that the Lord had planned for me. I thank the Lord that Joanna was willing to follow me and wait patiently for me through all my adventures; the ones the Lord led us in and the ones that I messed up in. Through them all we see that God has us right where He wants us to be, in His perfect will. I love you Joanna, thank you for all that you are. Next month begins the beginning of the School Calendar here in Okinawa. Joanna has been teaching English at the Day Care Center for the past year. Eder has filled in from time to time and the kids wanted to see him one last time so Joanna brought him along. The kids are absolutely adorable, they really love Joanna and Eder.